ZeticaUXO, with its Sitesafe Alliance partners, provide professional and cost-effective Explosive Ordnance Disposal (EOD) operations which aim to minimise disruption and ensure the safety of those present on your site. Below are a few examples of our innovative approach to ordnance disposal. ZeticaUXO completed the safe disposal of 3No. 500lb British Unexploded Bombs (UXB) without any disruption to the local community. This was achieved through detailed planning over a 16 month period, from the initial detailed desk study and risk assessment, to the final uncovering and disposal of the UXBs. Alongside the primary safety considerations, it was a specific requirement for the development that any such work would not disrupt the local community. After consultation with the relevant authorities and local stakeholders, the Explosive Ordnance Disposal (EOD) operation took place. 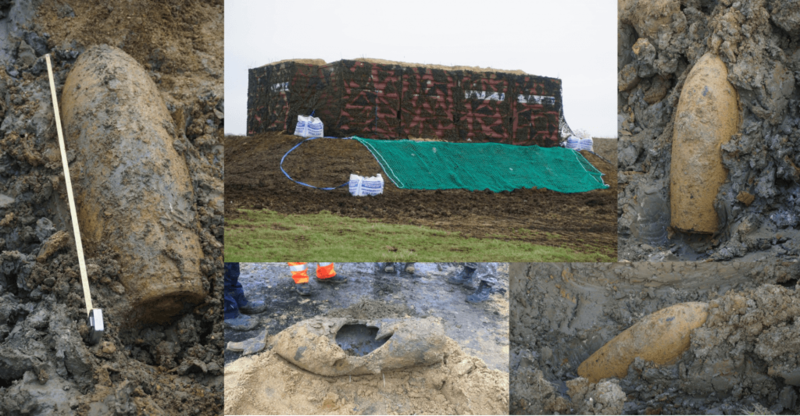 Directed by the findings of the UXO risk assessment and the results of a multi-sensor UXO detection survey, a disposal facility for the safe destruction of the anticipated UXB was constructed. This facility utilized over 800 tonnes of sand in its construction, ensuring that any safety perimeters remained within the site boundary. As a result of the detailed planning, ZeticaUXO ,along with its SiteSafe Alliance partner Ramora UK, not only safely disposed of 3No. 500lb UXB but despite the local community being aware of the operation they didn’t notice a thing! UXO was routinely being found during construction of a new railway station adjacent to one of the UK’s busiest airports. As a result the airport and one of the UK’s busiest stretches of railway were being temporarily shut-down whilst the military dealt with each item of UXO found. This cost hundreds of thousands of pounds and led to inevitable transport delays. Zetica put in place a systematic approach to screen out UXO during construction and undertook an Explosive Ordnance Disposal (EOD) operation that did not require any significant evacuation zones, meaning the railway and airport could continue operating even though ordnance was being dealt with. The system of work was proven effective and therefore had the full backing of all the relevant authorities, including airport security services and the Police. 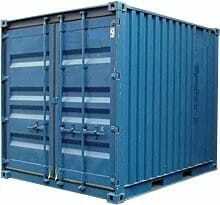 This involved the design and construction of an EOD containment facility that enabled the destruction of UXO to take place with effectively no cordon. By implementing the process, its estimated that Network Rail saved over £1,800,000 in charges due to delays of trains or aircraft. It has also relieved the inevitable tensions being created through regular shut down and restrictions of access during the military’s EOD operation. Zetica was commissioned to assist in the management of the UXO risk at a former Army barracks in Hampshire. As part of this, an ordnance disposal facility was established in case UXO was found during any surveys or later demolition works. During the demolition works a large number of small arms munitions were found, along with grenades. These were destroyed as part of an EOD operation. 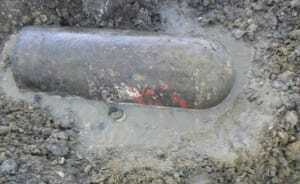 Additionally, two 500lb British bombs were discovered during excavation works. Our onsite EOC Engineer was able to determine that both were inert and they were removed from site.